These pages chronicle the playing legends of Altrincham Football Club. The texts have been kindly supplied by Terry Rowley, joint editor of the Robins' Review matchday programme. The profiles have previously appeared in the Robins' Review. By Terry Rowley, Joint Editor of The Robins' Review. Above: Limond is third from right, back row. I bet not many Altrincham supporters have heard of the name but Andy Limond was part of the first successful Altrincham side in the early years of the 20th century. Little or nothing is known of his early career but he first appears playing for Wigan County, a short lived predecessor of Wigan Athletic. They played at Springfield Park in Wigan, (the same ground that Wigan Athletic were to play at much later on). County were formed in 1897 with the aspirations of joining the Football League Division Two. Andy joined them as a young player but in early 1900 they were in financial trouble and Andy moved to Stockport County in February 1900, which was fortuitous, as Wigan County folded in April. Andy joined Stockport at the right time, as they were going well in the Lancashire League. He made his debut on February 3rd in a 3-2 win over Rochdale and was to stay in the team as they won the Lancashire League title, with Limond scoring once in 11 league games. In celebration, Stockport played a Rest of the League side and won that match 4-1. Applying to join the Football League, Stockport were successful and Andy signed up for their debut season in the League Division 2. The 1900/01 season was not successful with Stockport finishing second from bottom and having to apply for re-election in their first season. Andy played 30 league games out of a possible 34 and, in addition, played two games in the FA Cup. Injury however finished his professional career and he returned back to the Wigan area and turned out for Earlestown between 1901/02 to 1903/04, where he helped them to the runners-up spot in the Lancashire combination 2nd division and promotion to the 1st division. In October 1904 he was enticed to join Altrincham, who were putting together a championship winning side, Andrew making his debut, at left back in a 2-2 home draw against Northwich Victoria. He remained part of a very stable Altrincham side that took the Manchester League title by 6 points. In addition, Andy was ever present in the Cheshire Senior Cup in a side that saw off, Stockport County, Nantwich Town and Chester in the final to make it a league and cup ‘double,’ the attendance at the Drill Field that day was around 5000 as Altrincham triumphed 2-1 over Chester. In addition Altrincham nearly made it a ‘treble’ when they lost 1-0 to Berry’s in the Manchester Junior Cup final in front of 4000 spectators. This was the most successful season in Altrincham’s history to date. Andy Limond impressed all with his calm assurance and experience so it was no surprise that he was named Altrincham captain for the following season. 1904/05: 20 league games plus 4 CSC and 4 MJC games: 0 goals. 1905/06 17 league games, 3 goals plus 3 CSC and 1 MJC game with no further goals. Thomas Andrew Limond (it was not uncommon for people to reverse their forenames at that time), was born in Earlestown, near Newton-le-Willows, in 1877. Known variously in the censuses as Thomas and Andrew, by 1911 he had married and worked as an insurance agent. Later that year he sailed from Liverpool to Canada. At a stated age of 39 he enlisted for World War I. He died in 1943 in Quebec. On his WW1 military papers in Canada he erroneously gives his birth date as 5 May 1878 and place of birth as Earlston [sic], Lancs. He is described as 5ft 9ins with a scar on the inside of his left knee - perhaps a footballing injury! His father was an Ayrshire born foreman builder. Walter Baldwin is one of the unsung heroes of Altrincham’s early pre-Great War years. Born in Sale, as a teenager he naturally gravitated towards his local side Sale Holmfield, who were also in the Manchester League, along with Altrincham. His ability led to him being offered terms at Manchester City, who he joined, along with his brother, Herbert, in March 1904. Playing mainly for the reserves, Walter eventually made his first team debut, at inside-right on September 8th 1906 in a 3-1 away defeat to Sheffield Wednesday. He didn’t play for the first team again until the following season, on February 8th 1908, when playing at centre forward, City lost 1-0 away at Notts County and that was Walter’s entire Manchester City career. Released at the end of the season Walter moved south, (and his brother, Herbert, returned to sale Holmfield) and joined Reading, then in the Southern League Division One, for the 1908/09 season. 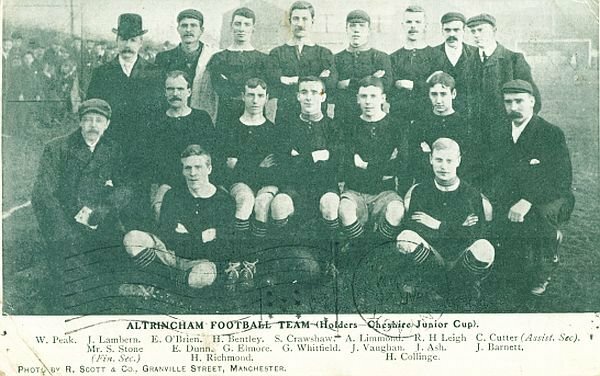 After spending a fruitless season unable to break into the Reading first team, playing only once as Reading finished bottom and were relegated to the Second Division, Walter moved back up North and joined Altrincham for the 1909/10 season. Walter made his inauspicious Altrincham debut on the opening day of the 1909/10 season, at centre forward, playing in a 4-0 defeat at Hurst. He made his scoring debut two games later in a 3-0 FA Cup preliminary round tie away to Ashton Town. Although overshadowed by Ellis and Barnett, who scored 20+ goals each, and shifted between playing centre-forward and inside-right, Walter still contributed over a dozen goals that season. Unfortunately, he wasn’t able to share in Altrincham’s Manchester and Salford Charity Cup (or Healey Cup), win over Hazel Grove, the final having been held over from the previous season, as only players on the books of the respective clubs at the time of the competition were eligible. For the 1910/1911 season, Walter persuaded another of his brothers, Ernest, to join Altrincham from Salford United, with Walter playing inside-right and Ernest inside-left, flanking centre forward Tommy Gell, they proved a useful forward line. The other distinction was that Walter was one of the players in the first side for Altrincham to turn out at Altrincham’s new ground, Moss Lane. That season Altrincham took the Altrincham District Cup, beating Northern Nomads and reached the semi-finals of the Cheshire Senior Cup, in addition to finishing second in their final season in the Manchester League. Ernest finished the season on 18 goals whilst Walter had 15 to his name. The following season Altrincham joined the Second Division of the Lancashire Combination and Walter and his brother helped Altrincham to promotion with at least 15 goals each and once again reached the semi-final of the Cheshire Senior Cup. The 1912/13 season saw Altrincham struggle to establish themselves in the stronger First Division. Although Walter finished with at least a dozen goals, Ernest found scoring tougher and had moved on to Nantwich Town before the end of the season. The following, 1913/14, season Walter came into his own, still playing at inside-right he scored at least 23 goals and scored the winner as Altrincham lifted the Altrincham Senior Cup. The final pre-War season saw Walter leading the line, yet again scoring regularly and, although records are incomplete, finished the season with at least 14 goals. Although Walter was in the opening line up of the 1915/16 season, (and scoring), his Altrincham career was nearly finished. War work meant unavailability and he was to turn out only once more that season. 1916/17 was a similar story with just two appearances, one in the Lancashire Combination and one in the Manchester Amateur League. In 1917/18 he played three times and in 1918/19 he made just the one final appearance in the first game of the re-convened Lancashire Combination, played on Boxing Day 1918, a 3-0 win over Northwich Victoria. What can be said is that Walter Baldwin gave six great seasons service to Altrincham football club, it could have been a lot more barring the war. In all probability he scored over one hundred goals for the club. This is a safe assumption based on the records that are available, Walter scored ninety-one goals in one hundred and eighty six games that are verifiable, a ratio of one goal every two games and given that there are sixty plus goals where the scorer is not known over this period there is every probability that Walter broke the hundred goal mark, especially as there are 30 plus games without verifiable line-ups. Pat was a clever ball-player, who not only scored goals but equally well provided chances for others. He came to Moss Lane having been a member of Macclesfield’s 1963-64 side, which won the Cheshire League and the Cheshire Senior Cup, a feat he was to nearly repeat with Altrincham in 1965-66. Born in Newcastle-Under- Lyme Pat joined Crewe Alexandra as an amateur and made his first team debut on September 1960 in a 3-1 defeat at York City. He signed professional in January 1961 and played 9 league games and scored 3 goals in the League. Pat was also part of the Crewe team that faced Accrington Stanley in their final game before resigning from the Football League, the game being declared void. Pat was then signed by Macclesfield Town in April 1963 for a then club record of £1,000. He made his debut on the 3rd April 1963 in a 3-1 win away at Wigan Athletic and finished the season scoring twice in 8 league games, (both goals coming in a 3-0 win over Wrexham), and two goals in two games in the Interleague Cup. The following season Pat lead the line effectively as Macclesfield swept to the league and cup double, with Pat finishing second top goal scorer with 34 goals, (25 in the league). Having been so effective, Colchester United were moved to sign him in July 1964 for £1200. Pat made his debut on 22nd August 1964 and, during the season, scored 6 goals in 21 league games in addition to three FA Cup appearances, (one goal) and 1 further game in the League Cup. Pat was then released in April 1965. He moved back north and was persuaded to join Altrincham and Pat proved to be an integral part of Altrincham’s championship-winning side that scored nearly 190 goals in all competitions, Pat himself playing 63 games. Only 20 players were used, (and three of those only played a single game, Paul Ogden played 2 games and Alan Wardle 3). Somewhat dwarfed by the achievements of Jack Swindells, Pat still scored 34 goals as the club's second-top scorer and made about the same number of goals again. He complimented Altrincham’s and in particular, Swindells's style of play, so it was a pity that he was unavailable for the majority of the following season due to injury. Pat played his last game for Altrincham as a late substitute in the Cheshire Senior Cup 3-1 win over Oswestry in January 1967. He was allowed to move to Runcorn for the remainder of the season. For 1967/68 he joined Northwich Victoria but he was in and out of the side and only played 7 games and scored 3 goals before moving on to Winsford United and latterly Sandbach Ramblers.